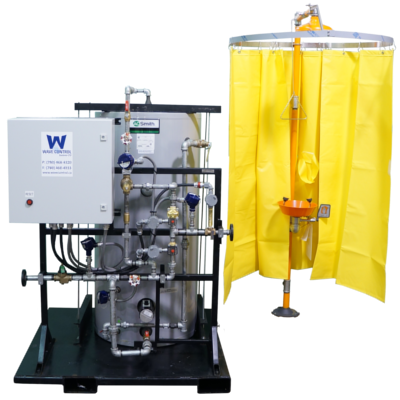 Our safety shower and eyewash stations are custom designed to ensure ease of use, compliance, and effective solutions to safety shower and eyewash station needs. They are designed for portable or fixed applications in petrochemical, industrial, oilfield, or commercial applications. We ensure all standard designs adhere to the toughest safety standards, and will customize to any degree our clients require. Reach out to us for more information. Wave Control specializes in the design, engineering, and delivery of process control, handling and automation equipment for the petrochemical, oil & gas, oilfield, and chemical industries. Our clients around the world trust our team to deliver the latest technology in our custom engineered or stock solutions for their demanding and process-critical applications. Look to our team for information or a quote on your next project. We pride ourselves on understanding our clients’ needs, premium quality manufacturing, and timely delivery.